Nothing is more important on a boat than having the proper anchoring system. We are the industry’s leader when it comes to the quality, strength and reliability of nylon anchor rodes. 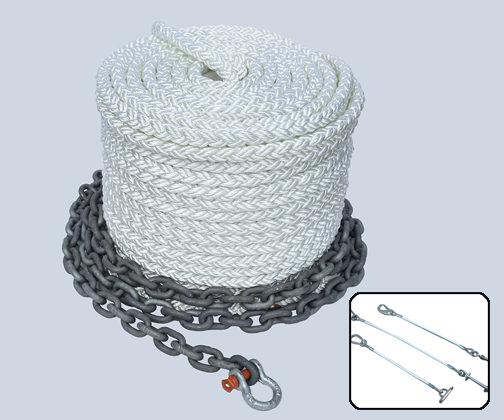 Our nylon is produced in the USA by the top manufacturers like New England Ropes and Buccaneer Rope Company and our chain is the highest quality galvanized high test chain produced by the Peerless Industrial Group. Our anchor rodes are specifically designed to work with windlass manufacturers like LEWMAR and MAXWELL and many other brands as well. However, you do not have to have a windlass to use our anchor rodes. Our anchor rodes are used for many of the OEM boat manufacturers including Sea Ray, Regal and many others.